The forecasting of wind speeds is very difficult as it relies on the position and passage of high and low pressure systems. 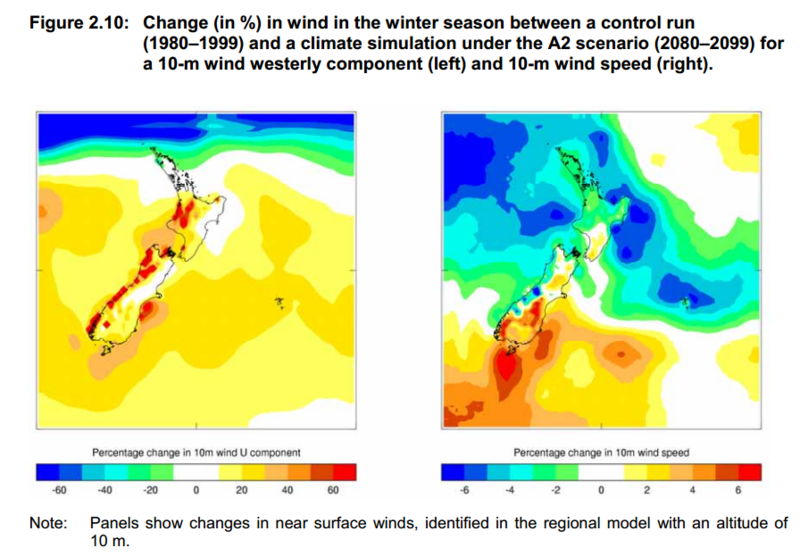 In the previous section it was shown how the wind direction and strength in New Zealand has changed bringing reduced rainfall to the East coast. Another important factor is that as the atmosphere warms it absorbs more moisture. For every degree increase in temperature the atmosphere holds 8% more moisture. As water is 25 times denser than air it give wind more 'body' and increases its apparent power and strength. A moist wind will blow down trees that a dry wind could not. A hurricane or cyclone will knock down trees and buildings that a dry wind like a mistral of the same speed can not. Using data from long term weather stations and then running climate models to check accuracy NIWA have forecast a likely outcome for New Zealand. In outline they are forecasting an increase in Westerly winds and a variety of changing wind speeds with stronger winds in the West and lighter wind in the East. This is a classic weather map of classic New Zealand weather and it shows how we get a series of high pressure systems from South Australia interspersed with low pressure systems which carry rain. Working on the principle that more heat can generate more power in a storm, then it would be reasonable to expect more powerful tropical storms and cyclones, In the summer when the hot water in the Pacific breeds cyclones the majority of them travel from East to West and are normally further North and land in Queensland. Occasionally a cyclone will leave the Fiji area and travel due South with the possibility of hitting the North Island. In the Winter, low pressure systems from the Southern Ocean get larger and travel further North to give us more storms. Summarizing an outcome for New Zealand. We should be alert for tropical storms from the North of the type that has hit Queensland and the possibility of more powerful storms from the Southern Ocean coming from the South West.